SAN JOSE — “The Changing Face of America” is the theme of the 33rd annual San Jose Day of Remembrance, to be held on Sunday, Feb. 17, from 5:30 to 7:30 p.m. at San Jose Buddhist Church Betsuin, 640 N. Fifth St. (near Jackson) in San Jose Japantown. The event is free and open to the public. Participants in the 2011 Day of Remembrance, which marked the 10th anniversary of 9/11. “To many within the Japanese American community, the Civil Liberties Act of 1988 demonstrated that America can be a great nation. America can look back in painful introspection and admit our past wrongs. But because our families and our community have been the recipients of the government’s apology and redress, many of us also believe that we bear a special responsibility to uphold the lessons learned from Executive Order 9066. “The Civil Liberties Act of 1988 stated that the government’s actions ‘were motivated largely by racial prejudice, wartime hysteria, and a failure of political leadership.’ The reference to ‘prejudice’ strikes a special chord with many Japanese Americans, leading us to believe that we must not be silent when we see our neighbors, friends, classmates, colleagues, and various communities become the targets of discrimination and violence. The 2013 San Jose Day of Remembrance program reflects this belief. “The 2013 Day of Remembrance program, ‘The Changing Face of America,’ acknowledges the changing composition of America. Many political observers have stated that the 2012 election results demonstrated a dramatic shift in the demographics of the country, citing the increasing influence of particular groups, such as Latinos, Asian Americans, African Americans, women, and younger Americans. The election also revealed some progressive gains in LGBT equality, the great civil rights struggle of this decade. “Accompanying this dramatic demographic and attitudinal shift is an increased risk of backlash, intolerance, ignorance, xenophobia, and violence. Some vocal segments of society have challenged or do not accept President Barack Obama’s American origins and his Christian faith; the Muslim American community has been under special scrutiny since the terrorist attacks of 9/11; and some groups, like the Sikh community, have been the target of violent hate crimes. “For the first time in San Jose Day of Remembrance history, a representative from the Sikh community, Simran Kaur, the advocacy director of the Sikh Coalition, will speak at the annual event. The Sikh community has been a target of violence in the post-9/11 world, including the recent temple massacre in Oak Creek, Wis.; the 2011 double murder in Elk Grove, Calif.; and the 2006 attempted murder in Santa Clara, Calif.
“Other featured speakers will be Molly Kitajima, a Japanese Canadian who was incarcerated by the Canadian government during World War II; Congressman Mike Honda; and Sara Jaka from the South Bay Islamic Association. “The program also includes a performance from internationally acclaimed San Jose Taiko, a candle-lighting ceremony and remembrance, and the traditional candlelight procession through historic Japantown. The Japanese American Museum of San Jose (JAMsj) will also have a special exhibit on display at the event. For more information, email [email protected] or visit www.sjnoc.org. 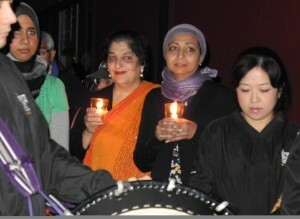 The Sikh Coalition (www.sikhcoalition.org) was born in the aftermath of bigotry, violence and discrimination against the Sikh population following the terrorist attacks of Sept. 11, 2001. It is a community-based organization that works towards the realization of civil and human rights for all people. In particular, it works towards a world where Sikhs may freely practice and enjoy their faith while fostering strong relations with their local community wherever they may be.